As an introvert, I’m happy to have a whole week of holidays, where I can stay home, far from the maddening crowd, and read books. 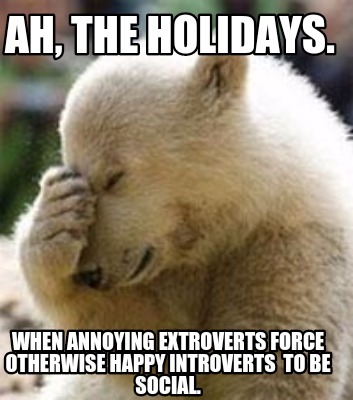 The problem is that my well-meaning friends try to ‘cure’ me out of my introversion by insisting that I hang out with them. A person with the INFJ personality type is supposed to be a paradox. I don’t know if this is true and I usually don’t believe in generalizations and stereotypes, but as an INFJ, I can tell you that I’m a bunch of contradictions.